USANA, word! : Are you getting enough D in your day? Too much sun can cause skin cancer (we already have the highest rate of skin cancer in the world) yet the sun is also the main source of bone-building vitamin D and lots of us in Australia and New Zealand are low on this vital nutrient. Confused? You’re not alone! Vitamin D is fat-soluble (so it can be stored in the body) and it is unique because unlike most vitamins that we get from foods and drinks, most of our vitamin D is produced when a fatty substance in the skin reacts with sunshine. The body then converts this into vitamin D and stores it for when it’s needed. Around 90 per cent of our vitamin D is produced in this way; just 10 per cent or so comes from foods. Healthy skin health. This may sound like a contradiction as too much sun exposure can trigger skin cancer. But having enough vitamin D and related compounds in the skin may actually protect against UV damage according to the University of Sydney’s Professor Rebecca Mason. So why are we falling short of vitamin D target? Professor Mason explains that the values for vitamin D are higher nowadays as they’re based on a concentration of vitamin D where most bone and muscle function is close to normal; this figure is a bit higher than past targets. More people with naturally dark skin (melanin absorbs the UVB light that converts a compound in skin into vitamin D) and/or who cover up with clothing. More obese people (vitamin D gets into fat, but isn’t released until the fat is broken downi). More people working indoors and being entertained indoors (i.e. computers, video games etc). People with osteoporosis and babies of mothers who are low in vitamin D (especially if the babies are being breast-fed) also fall into the high risk group for vitamin D deficiency. The United States recently increased the recommended daily intake of vitamin D and since our last NHMRC recommendations were made around a decade ago, it looks like the recommended daily levels of vitamin D are set to rise in Australasia, too. So how can you get more D into your day? Enjoy more D-containing foods such as oily fish (salmon, sardines and swordfish), fortified breakfast cereals, eggs, fortified milk, lean meat and UV-exposed mushrooms. ‘In winter, the sun exposure to arms or equivalent needs to be around noon and for from seven minutes (Cairns) to 30-40mins (Hobart) most days hands, or equivalent area of skin, spread over a week to maintain adequate vitamin D levelsii. 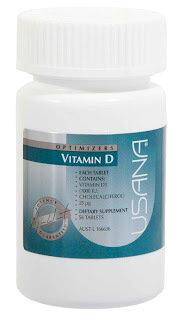 ‘The energetic UV that produces vitamin D is not around in early morning or late afternoon. In summer, you risk too much UVA exposure for the amount of vitamin D you make and in winter, in most of Australia, you won’t make any vitamin D early morning or late afternoon’ reveals Professor Mason. ‘Vitamin D supplements are suitable for people who are advised not to go outside (people with sun sensitive skin and people who are immunosuppressed,’ says Professor Mason. ‘People with naturally very dark skin may need three to six times this amount of exposure and so it may not be possible to maintain vitamin D levels and you may need to take supplementsiii’. People taking medications which interfere with vitamin D metabolism or have difficulty absorbing nutrients, plus people taking medicines that affect vitamin D metabolism may also be at risk of D deficiency. Note: anyone with vitamin D deficiencies should discuss intake levels with his or her physician. USANA Vitamin D; each tablet contains vitamin D3 (cholecalciferol) 1000 IU/25 micrograms. Suggested dose: take one table daily preferably with meals. 1. Professor Mason and Mr MacWilliam are not paid by USANA and not associated with USANA, in any way.